Today as the dog and I were walking on a early-February-dressed-as-late-March day, I thought to myself, Of course! It’s all geography! And then set my feet on the homeward path knowing I’d know what I was talking about when I got back home. But I didn’t. All I remember is the feeling of ah ha! and those now meaningless words. This is like solving a complex problem in your dream—or writing the perfect paragraph, or understanding a foreign-to-you language, or suddenly realizing the answer to everything—and then, upon waking, knowing nothing more than the distance between your feet and the floor. So I did the dishes, then wrote an email, then let the dog out, then back in (we’d already done the walk, but he needed to check up on his best friend, the squirrel; the admiration is not mutual, alas…), and then painted the inside of the canelé molds with “white oil” in preparation for baking later today. And I still didn’t know what I’d been thinking, but I had a prickly inkling. You know that feeling that there’s something beautiful just out of reach, and you can almost sense it in your peripheral vision, but you can’t see it; or you catch a scent of something so delicate that you’re not sure such a thing exists, so you keep sniffing and swinging your head in hopes of catching it again; or there’s that elusive owl in the dark who hoots every time you’re alone with the trees but refuses to converse when you bring a friend. There are things everywhere like that, real and imagined, so close you think you might just be able to call it gently and coax it to your side, hesitant and unsure, but it keeps its shy distance from you. The other day I was looking out the bathroom window through a snow squall and I saw what looked like an exploded milkweed pod up high in the sumac. All fluttery white and brown. How odd, I thought. How did that get there? 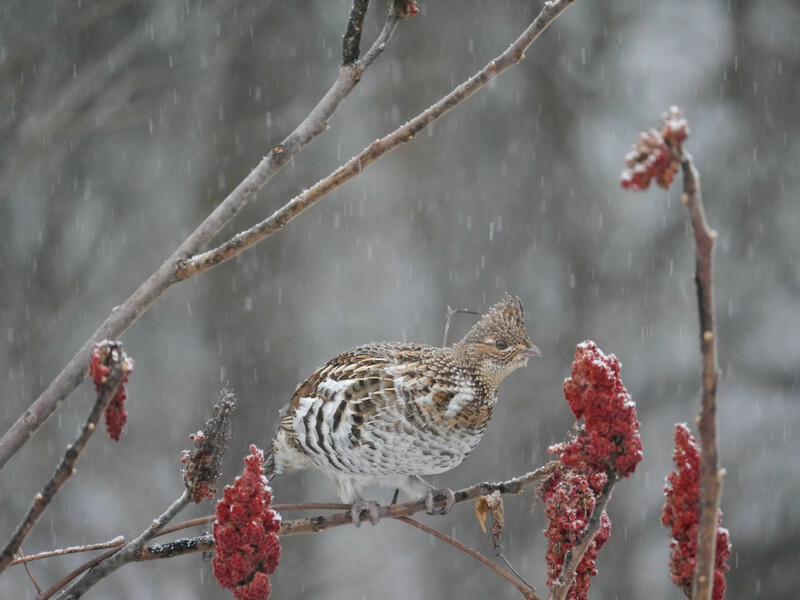 Until my eyes looked beyond my first understanding and the ruffed grouse resolved itself the way a Magic Eye painting suddenly becomes three-dimensional; when you learn how look in just the right way. I ran to the living room window and it was still there, a puffed ball of feathers and a tiny crested head, impossibly still on a tender branch. I grabbed the camera, opened the back door, and slid between the snowflakes, trying to walk silently as I imagined a true tracker would to the edge of the deck, but instead making an awful racket on the crusty snow. Still he (she? the difference is subtle, apparently, observable in the coloration of the tips of the tail feathers) remained. The puff was gone, but there he sat, toes curled around the branch, while I clicked the shutter over and over so that I could prove to myself that this one elusive moment was real. Cold, I went back inside. I looked out the window. But he was here (I have proof of some sort). And I am here. And at that moment, both together with the snow flying down, anchored miraculously on this whirling planet. When the snow first started to fall, huge drowsy flakes, meandering past the window, I looked slightly away and saw the movement on the edges of my vision and had that sensation of being in a train car in the station and the train next to you pulls away and you feel for an instant that your train is the moving one. Am I moving? Or is everything else moving? Or are we moving together? The grouse exited by way of the air. I’m hopelessly terrestrial. Geographically connected, making shapes in the wind. Ogosh. This is just gorgeous. I love love love this. Thank you so much for this. I so appreciate it! What a thought provoking post, I have that happen often and try to hang on to the idea, the words, so I won’t forget , so I don’t let them go , and still often they are gone and as happened to you I need to let my mind be distracted on other things and often the idea , the words will come up again. Amazing. Love your writing. It’s true. Oftentimes, focusing on something else helps allow the other thing to resurface. Thank you so much for your kind words! Truly a lovely post. And what an amazing photo! Thank you for putting this feeling into words. Oh thank you! How kind of you….